Sheikh Salah Coveting the Caliphate? 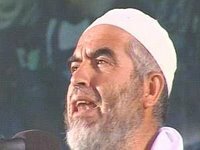 Islamic Movement's leader, Sheikh Raid Salah, seems to be coveting the currently unoccupied position of Caliphate over all the Muslim world. Hmmmm. According to the Jerusalem Post, Salah urged both Hamas and Hezbollah to hang onto their hostages and use them to secure the release of "all the security prisoners currently incarcerated, and all Israeli Arabs imprisoned for security reasons. At the annual gathering, drawing some 50,000 to the soccer stadium in Umm el-Fahm, Salah also said that the day "was not far off" that Israel's rule over the Temple Mount would be thrown off, and Jerusalem would become the capital of a new Muslim Caliphate. Methinks he sees himself in the starring role of this little production. In response to Pope Benedict XVI's recent comments about Islam, which have sparked protests throughout the Muslim world, Salah condemned the statements, and hoped that they had been unintentional. The new Vatican secretary of state, Cardinal Tarcisio Bertone, said that the pope's position on Islam is unmistakably in line with Vatican teaching that the Church "esteems Muslims, who adore the only God." "The Holy Father is very sorry that some passages of his speech may have sounded offensive to the sensibilities of Muslim believers," Bertone said in a statement. And I know Reuters isn't the best source for reliable opinions but this video shows your brethren burning an effigy of the Pope. That's really not a very nice way to show your interest in peaceful coexistence, now is it? In fact, the burning of Churches in Nablus was even worse--injuring and killing innocent and peaceful worshippers who wanted nothing more from life than to praise His Name in the holy land. The UN force in Lebanon (whomever that's supposed to mean) claims the IAF is violating the Israel-Lebanon ceasefire by patrolling over Lebanon's airspace, and they intend to launch an official complaint against Israel. Well, that ought to set things right again because we all know how effective it is to complain to the UN when its directives and resolutions are not carried out. That's right, the UN Security Council will send some forces right on over there to...no, wait, already did that. They're the ones whining instead of controlling and patrolling the area so there'd be no need for the IAF to continue policing via the air. Ah, silly me. 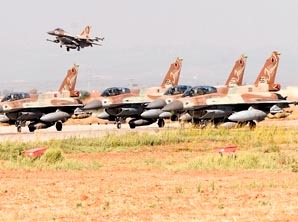 The unnamed UN Security force spokesman said that IAF fighter jets had carried out some 35 violations of Lebanese air space, in breach of the ceasefire agreement reached with the UN Security Council. But then, we all know Hezbollah would never be planning any kind of continued violence against Israel. 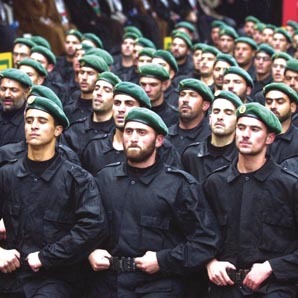 Even Amnesty International had only "good things" (not) to say about Hezbollah. On the lighter side, read Hezbollah's opinion of Amnesty Int'l. here. They just love those guys! Fatah gunmen went on a rampage in Gaza City on Saturday, raiding several schools and firing into the air in protest against the assassination of Gen. Jad Tayeh, a senior officer belonging to the Palestinian Authority's General Intelligence Force. But according to AP News just a few days ago, Fatah was so "moderate" and looking to make "peace" with Hamas so they could both get the gravy train rolling in US Dollars of "aid" again. The motive for the attack was not immediately clear, although officials speculated it could be an internal feud within the intelligence service. Security officials said the attackers took a black briefcase that Tayeh was carrying. "This crime and its timing is a dangerous message. We won't accept it or stay silent," said Interior Minister Said Siyam. He said the attack appeared timed to disrupt negotiations to form a national unity government. 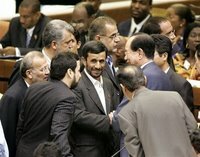 Iran's President Mahmoud Ahmadinejad, center, shakes hands with North Korea's No. 2, parliament leader Kim Yong Nam, during his recent visit to the UN. See, Ahmaden-jihad has this little fantasy going where he's actually a world leader, not a terrorist among terrorists. Then he goes and ruins the illusion by hob-nobbing around with North Korea, wining and dining Venuzuela's Chavez (whom we all know is such a kind and caring leader among *ahem* men...sorry, just choking on the words, even as sarcastic as they are). But you know, maybe Ahmaden-jihad has the Venuzuelan's number. Chavez just vowed "to defend Iran against any attack" - sure sounds like undying love to me!! There you go, boyz! Finally admitting you want a new world order is the first step to solving the problem. New world order coming right up! You guys have any room left down there in the bottom-feeder slots you've now claimed as your own? Cause you left someone out, you know? 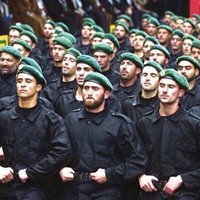 Don't like Nasrallah anymore? Did he say something bad in his Al-Jazeera interview? tsk tsk tsk But you were so cheeky with him just last week! One of the uniformed Barflies took a little road trip last week. Since Shane drives a tank, when I heard him say something about "road trip," naturally (but mistakenly) I assumed it meant the unit was moving locations. It was a different kind of journey entirely. A friend had died. Shane returned to the States for the funeral and traveled back through his memories on a moving journey of a lifetime. It will be time very, very well spent and do honor to a memory well-worth preserving. Lift a glass and say a word of thanks to men like Chief Petty Officer Paul Darga. He lived and died so we can be free. So, no, no comics, cartoons or much relief here. I just like the phrase and used it. You lose. I lost, too. I had this whole thing written up to go last night when my net connection flaked--or blogger did--and I got disgusted (not amused) and logged off. So. Let's try this again, shall we? Or at least part of it. 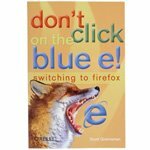 I was going to share some of the funny, funny things I read in books. Unfortunately, I'm feeling far too lazy this morning to type in (again!) my #1 favorite funny line so you lose (again). Maybe later--or tomorrow. My all-time #1 favorite one-liner involved tongues and Lois McMaster Bujold's character, Miles Vorkosigan. That's enough of a clue for any Bujold/Miles fans out there. You can chuckle just knowing which one-liner The Beautiful Quinnie tossed out there which might be regarded as my all-time #1 favorite (to date). DAMASCUS, Syria — Three Islamic militants suspected to have Al Qaeda ties were killed Tuesday after a failed attempt to attack the U.S. Embassy with automatic rifles, hand grenades and a van rigged with explosives. A Syrian security officer was also killed, but no Americans were hurt. One of Syria's anti-terrorism forces was killed and 11 other people were wounded, the official news agency reported. The wounded including a police officer, two Iraqis and seven people employed at nearby technical workshop. A Chinese diplomat also was hit in the face by shrapnel and slightly injured while standing on top of a garage at the Chinese Embassy, China's Foreign Ministry said. The diplomat, political counselor Li Hongyu, was in stable condition at a hospital, the ministry said. So they are killing themselves, their neighbors, their alleged allies BUT there's no violent Radical Islamofacism in Syria, right? Yeah, just checking.